Taking photographs of the things I love is such nourishing self care. 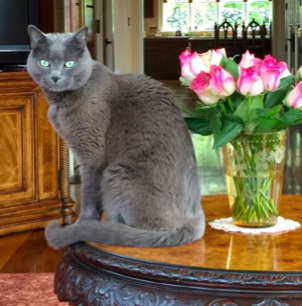 My cat, Poupon, a favorite antique table and flowers, all make me smile. Let’s see yours. What happened next was magic. Members of my Facebook community instantly began posting their own images. People posted pictures of their favorite places. Susanne Wieland, for instance, posted a photo of a beautiful room she’d just decorated. Some folks shared their art. Mary Murchison posted the most extraordinary photo of a Mandala she created using plant material. Others attached pictures about special events. Debra Payne celebrated her new grandbaby by posting a fun announcement that included her dog and her favorite books. 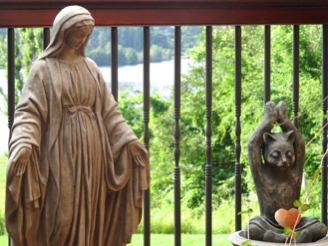 And of course, there were plenty of shots of furry friends, family members (not so furry), flowers, and nature scenes. More than 500 of them! Over the next few days, I took my time going through every picture. Some made me smile, others made me tear up, and some had me laughing out loud. What we take into the body via the senses affects our physiology. Images that evoke positive emotions, for example, produce brain chemicals that reduce inflammation, elevate mood, and calm and nourish various systems of the body like the digestive, cardiovascular, or reproductive systems. So essentially, when we smile, the body smiles, too. I appreciate beauty and I believe in its healing power, so I surround myself with art and images that feed my soul and keep my body nourished. 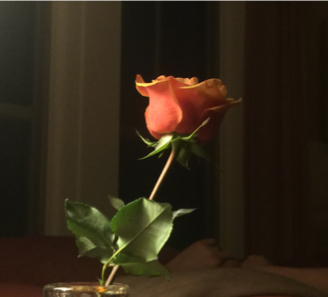 Here are a couple of examples – one from my deck garden which has several statues that invoke a spiritual sense of peace and calm; and the other of a rose that landed in the most extraordinary light just after sunset. Whether you’re in a low mood, grieving a loss, feeling under the weather, or just in need of a smile, give yourself the gift of sharing and receiving beauty. First, grab a cup of tea, sit back, and enjoy the experience for yourself by looking through the earlier posts on Facebook, here. Then, if you’re so inclined, share a photograph of a favorite image of your own – your art, a scene that makes you feel good, or something fun – on my Facebook page, here. Lift your spirits, shift your mood, and boost your immune system all at the same time! Here’s something that might make you feel inspired and uplifted. You can watch it, here.